History of Russian swords and sabres. Russian swords from early medieval times till ww2. Russian swords, sabres, backswords, shashkas and military swords used in feudal times, imperial Russia and during Soviet regime. The early Russian swords were made under viking influence. These swords were typical by a straight blade with a short guard as we know from viking warriors. The same swords can be found around the Europe at the same time. These viking swords evolved from late Roman spatha sword. Since 1909 the Department of the military warrant (order) No. 409 authorized Cossacks of all the Cossack units and formations to do service with "grandfathers weapons" – i.e. the edged weapons inherited from the predecessors. 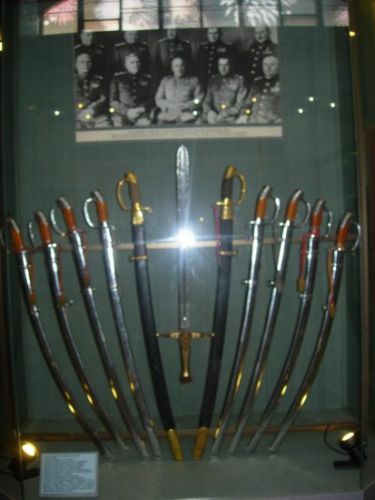 That decision also affected the armaments of the Guards Cossack regiments, wherein devised and adopted for carrying outside formations were specific officer sabres patterns, organic to them, called "clytch"es (Shamshirs or Mamelukes). Four patterns like that are known: the Life Guard’s Cossack regiment clytch (Sham shir), the Life Guards regiment clytch (sham shir), the Life Guards South Don Cossack battery of the Guard’s mounted artillery "clytch" (sham shir) and the Urals hundred of the Life Guards Composite Cossack regiment clytch (shamshir). These clytches (shamshirs) replicated – in shape and scabbard ornamentation style – the light cavalry and Cossack sabres of the late XVIIIth – early XIXth centuries. 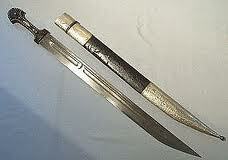 Russian kinjal (kindjal) is a curved knife used by cossacs together with shashka. Origin of kinjal is in Caucasia and in Persia.